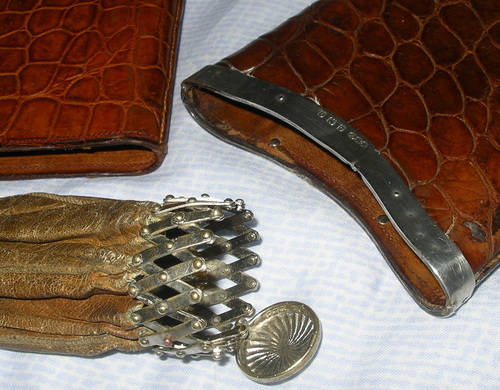 Leather pouches for what ? I came across these in a box lot of bric-a-brac and was going to put them up for sale , but puzzled as to what they are . 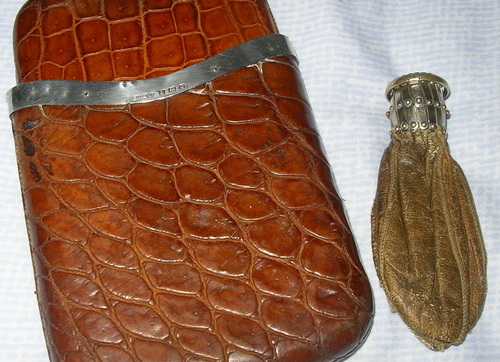 The big one is 4" wide x 3/4" deep x about 6" ( extends to 7" + ) and I think may be for cigars or pens . It is marked Wilmot manufacturing & Co , Birmingham , 1938 ( think that is right ) and has a silver shield with the letters FD or JD who I presume it belonged to . 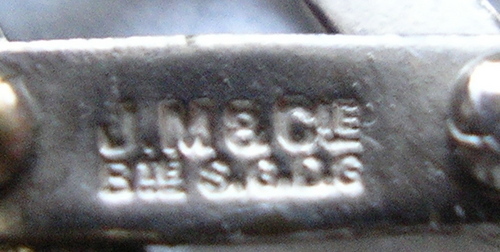 The smaller pouch is silver plate I think , J M & C( after the C it looks like IE with a line underneath ) then B ( same IE ) , S.G.D.G. This smaller one is a French patent ( SGDG ) but what was it used for ? Money , tablets , baccy , bullets …??? . It is less than 4" long but opens wide up with the concertina top . Anyone any ideas as to exactly what these were made for ? Another pic in next message . You have all your details right on the pocket cigar case. The plated item is fun. I would put my money on it being a purse but I can’t say for sure. They aren’t very valuable objects, but I would be inclined to keep them anyway because they are quite unusual. I’m sure you could find some use for them! Thanks for your help Jonothan , the plated ’ purse ’ I think has more to it than just for keeping money in . It is small so either it was for very small coins or someone who never had much money ?